The Municipality of Tweed would like to thank Brian Hadley and Karen Shaw and the whole staff from Belleville Sport and Lawn for their support of the Municipality of Tweed Fire Department. 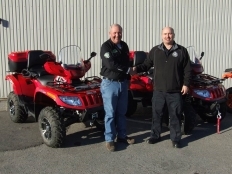 They have provided our Municipal Fire Department this Arctic Cat ATV to use for one year. At the end of the year it is sold and replaced with a new ATV.